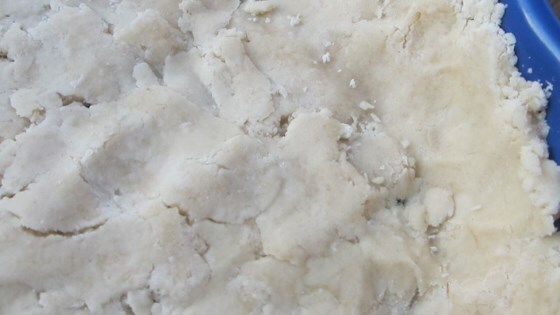 "This is the EASIEST way to make a quick two-crust pie crust! Forget measurements and pastry blenders! Whatever amount of flour you need, you then take HALF that amount for your lard and margarine. Motto "Half as much fat as flour." Do as the English do and use half lard and half margarine for the shortening." dough was hard to knead. fell apart whenever touched. and was impossible to get thin enough for pie. i definitely will not be going through that again! A bit of salt will help it brown. About a teaspoon should be right. Really good, makes nice pastry. This is the same recipe that my grandma has been using for years. Good tip -chilling the dough makes it a lot easier to work with, but you can roll it right away if you like.